Don’t be afraid of the dark…or of the modh coinníollach! Is bheinn ag gabháil ceoil le mo chailín rua. I just have to say it. 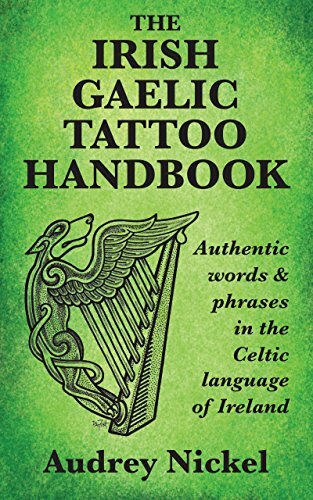 Ever since I started learning Irish, I’ve heard people speak with dread and loathing of the modh coinníollach (pronounced, roughly “mohg kun-EE-lukh”). “It’s too difficult!” “I’ll NEVER get it!” “Why do we have to have this in the language?” “Can’t we just get rid of it?” (this latter group usually wants to do away with the tuiseal ginideach — the genitive case — as well). As I’m sure you can imagine, by the time I was an advanced student, I’d built the modh coinníollach up into a terrible monster in my mind! And I wasn’t alone! I’ve even seen an entire class of advanced students turn white as sheets when the teacher suggested doing a drill on the modh coinníollach. I swear, you’d have thought he’d asked us to rappel down Sliabh Liag using dental floss! So what is this terrible thing that has been terrorizing Irish students for generations? Well, if you listened to the above video (And you should. Des Bishop is hilarious! ), you already know: It’s simply the conditional mode of a verb. Furthermore, if you’re a student of Irish, it’s likely that you’ve been using the modh coinníollach from some of your earliest lessons. Does any of this sound familiar? Cad é ba mhaith leat? : What would you like? Ar mhaith leat cupán tae? : Would you like a cup of tea? Ba, ar, and níor are, in this case, conditional forms of the copula is. And I would be (bheinn) making music with my red-haired girl. I suspect one reason the modh coinníollach worries people is that they’re not sure how or when to use it. Formal grammar terminology can be intimidating if you’re not familiar with it (and sometimes even if you are!). And “modh coinníollach” certainly is a mouthful, even in English (“conditional mode/mood”). Modh = “Mode” or “Mood”: A distinctive form, or set of forms, of a verb. Coinníollach = “Conditional”: Something that is dependent on certain conditions. The first part of the sentences above tells you what would need to happen (more money, more time, no rain) to make the second part happen (buying a Ferrari, writing more blog posts, going for a walk). Were (Not as in the past tense — “the boys were playing” — but in the subjunctive — “If I were rich.”). But perhaps the issue isn’t so much knowing when to use the modh coinníollach as knowing how to form it. The thing is, it really isn’t difficult. It’s certainly no more difficult than other Irish verb forms (which, because of the relative lack of irregular verbs in Irish – there are only 11 – aren’t all that difficult at all). If you can learn the future and past tenses, you can learn the modh coinníollach, and I’m going to give you some basics to get you started. With a nod to The Moody Blues*, then, let’s get started. (*And yes…I know the name of the CD is actually “Days of Future Passed.” But this always pops into my head when I think about the modh coinníollach – you’ll see why in a moment – so I think the band will allow me a little leeway). If you know how to form the past tense and the future tense of regular Irish verbs, you’re more than halfway to knowing how to form verbs in the conditional mode. 2. If it begins with an unlenitable consonant, leave it alone: Lean sé: “He followed. * Independent verb forms are those that don’t “depend” on a particle: “an,” “ar,” “nach,” etc. D’fhanfadh sé: He would stay. One way in which the conditional mode differs from other verb forms is that the first- and second-person singular are formed a little differently. The first- and second-person singular forms in the modh coinníollach always incorporate the pronoun into the verb itself (if you speak a dialect that uses táim and táimid instead of tá mé and tá muid, you’re already familiar with this concept). Technically, these are referred to as “synthetic” verb forms. For second-person singular, that means the verb ends in “-fá.” I have no mnemonic for you for this one. It’s just one you’ll have to learn. But it’s unusual enough that it’s actually pretty easy to remember. See how easy it is? Just follow the pattern! It’s a bit of a struggle at first to remember not to add a pronoun after the word (for example, it’s just shínfinn, not shínfinn mé, because the pronoun is already incorporated into the ending), but it’s just a bit of practice…nothing insurmountable. Again, these are synthetic verb forms, so don’t stick a pronoun on the end…it’s already there. Next week we’ll explore the negative and dependent forms of the conditional mode. In the meantime, spend some time practicing what I’ve given you here. Really, the point of this post is not to make you an overnight expert, but to minimize the angst that seems to surround what really is a very basic and simple verb form. Don’t shy away from it! It really is no more difficult than any other verb form. Why it’s developed its fearsome reputation I have no idea, but you’re doing yourself a disservice if you avoid it. You would be much happier, and you could find yourself much more comfortable with conversational Irish, if only you would let go of your fear! The featured picture at the top of this post was taken on midsummer eve in Ballyvaughan, Co. Clare. The cottage is in a little holiday village where I and some friends stayed for a week, making music and seeing the sights. © 2008, by Audrey Nickel. Four words. Three different verbs to express one simple idea. Hi Audrey, Thank you for this very helpful post about the Modh Coinníollach. So it seems that one has to mutate the beginning and end of the verb in Irish to express the conditional mood. In English it seems to me that one has to use auxiliary verbs (would, could and should.) also known as helping verbs to express this grammatical mood. No comparison between the two languages in my opinion. But I would like to talk to you about using the Copula ‘IS’ to express the conditional and also the past tense. The Copula ‘IS’ is the present tense and ‘ Ba’ is the past tense is that correct? If I said, ‘I was a teacher’s this could be given in Irish as, ‘Ba mhúinteoir mé’, or ‘ Bhí mé in mo mhúinteoir. You say that, ba. ar, and níor are the conditional forms of the Copula ‘IS’. We know that the Copula is used to say what a thing is or is not. I find it difficult to understand how it expresses the English forms would, could, and should which are helping verbs in England and seem to be alien to Irish. I know we are learning Irish through English and that can be a help or not a help. Please let me know what you think of this comment and many thanks for your helpful post. The issue is that “ba” is both the past and the conditional. We have to deduce which we’re encountering by the context. It’s just one of those things you have to memorize, I’m afraid. Hi Audrey. Two things! Firstly, I hear some Americans on TV saying this sort of thing: ‘If you woulda told me I woulda been better prepared. (Instead of ‘If you [had] told me….). As you know, normally in Irish if the conditional is used in one clause in a sentence, it is used in the rest of the sentence also. I like to point out that there is a consistency and logic in Irish which differs from English. It seems that at least some Americans apply this logic to English too, but I wonder how widespread it is? Second thing – typo: d’fhanfaidís is missing a séimhiú above. And how have you been, by the way? Long time, no see! Great, thanks. Still teaching away (and participating in Facebook group Gaeilge Amháin). Deas a fheiceáil go bhfuil tú féin fós gníomhach ar son na Gaeilge. Next Next post: Clannad (Not the Anime) Abú!